T-R PHOTO BY THORN COMPTON Ñ BCLUW shortstop Easton Swanson, facing, approaches the plate as her teammates surround her after she hit a home run in the sixth inning of the CometsÕ win over Waterloo West on Saturday in the Dave Lee Classic. BCLUW also beat Cedar Falls later in the day to finish 3-0 in its home tournament. 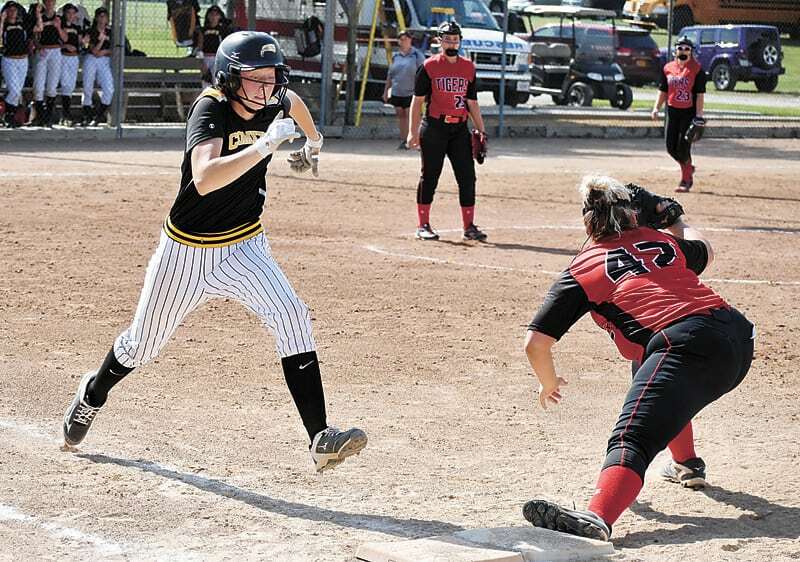 CONRAD — After starting off the Dave Lee Classic with a win over Class 5A Marshalltown, the BCLUW softball team faced two more big schools on day two of their home tournament, opening the day’s play with Waterloo West and closing out with a meeting against Cedar Falls. The Comets would replicate the success they experienced against the Bobcats, defeating the Wahawks 5-0 in the first game then finishing the tournament with an 11-3 win over the Tigers. 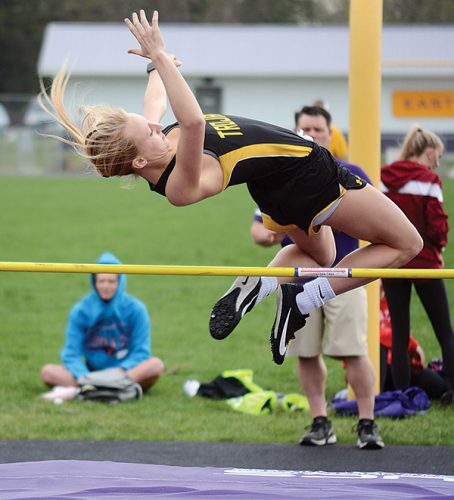 BCLUW co-head coach Megan Yantis said she couldn’t have asked for anything better than her team coming away with three wins over larger schools over the weekend. Comets sophomore Madison Ubben set the tone in both games as the leadoff hitter. In the first at bat against both Waterloo West (4-14) and Cedar Falls (6-13), Ubben reached base off a walk and was eventually brought around to score to put her team in the lead. T-R PHOTO BY THORN COMPTON Ñ BCLUW second baseman Madison Ubben throws the ball to first base after making a stop in the gap in the CometsÕ win over Waterloo West on Saturday in the Dave Lee Classic. Ubben was walked three times against the Wahawks, scoring once, and against the Tigers she went 2-for-3 with two runs and a walk. 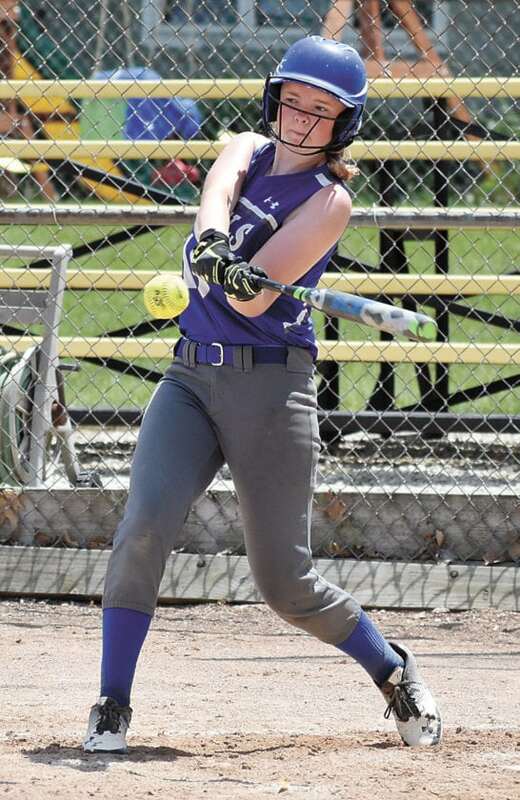 Easton Swanson had some trouble in her first couple of at bats against Waterloo West, but in the sixth inning she got all of the ball for a solo home run that dented a car in the outfield, all while Central DeWitt head coach and Swanson’s father Lee was watching. Swanson used that homer — her second of the year — to jumpstart her swing, and in the game against Cedar Falls she finished 3-for-4 with two RBIs and two runs scored. She actually drove in the first run of the game, hitting a two-out single to send Ubben home, and Swanson said that hit didn’t only get her going, it got the rest of the team going. Proving Swanson’s point, Cate Nason, Kaylee Goecke and Lili Wilson all followed that RBI in the first inning against the Tigers with back-to-back-to-back RBI doubles. 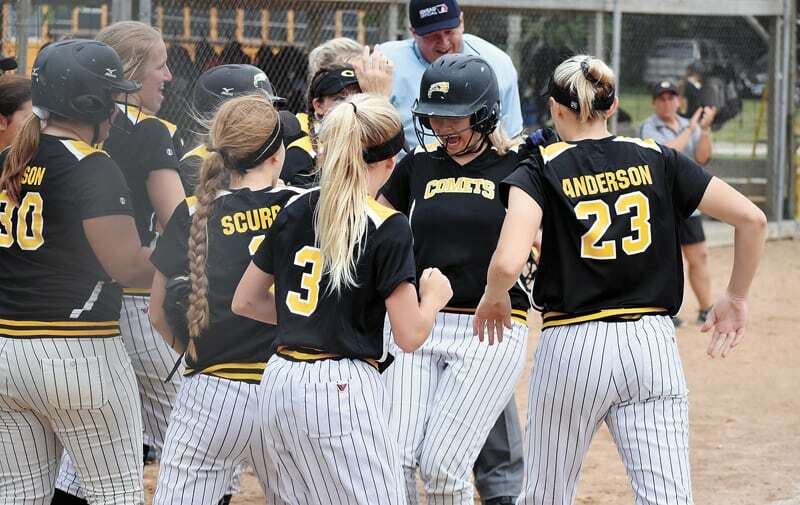 The Comets’ other co-head coach, Ashlee Higgins, said the girls’ bats were all on fire over the course of the weekend, and she wants that to continue moving forward. 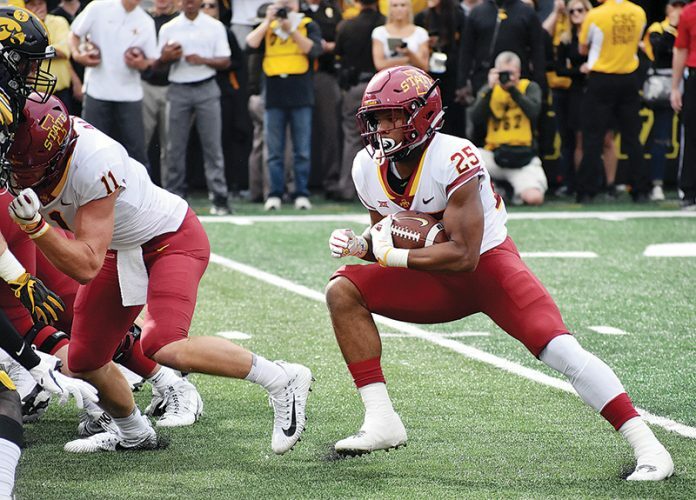 “Hopefully that just builds their confidence as we go into a tough conference week next week,” she said. 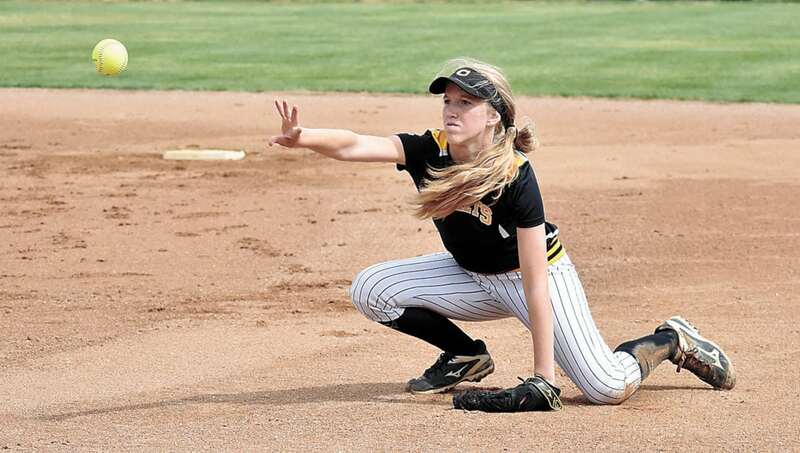 While the girls were rounding the bases, they were also getting it done on the defensive end. Lauren Anderson and Bailey Ashton combined for a four-hit shutout against Waterloo West, with Anderson starting the game and Ashton relieving her in the fifth. Ashton then started in the circle against Cedar Falls, pitching four innings of two-hit, shutout ball before turning things over to Kiersten Kruse. Kruse struggled a bit in her first inning against the Tigers, allowing a home run to the first batter she faced and giving up three runs in the bottom of the fifth, but she closed out the sixth inning strong with a 1-2-3 inning, including two strikeouts. 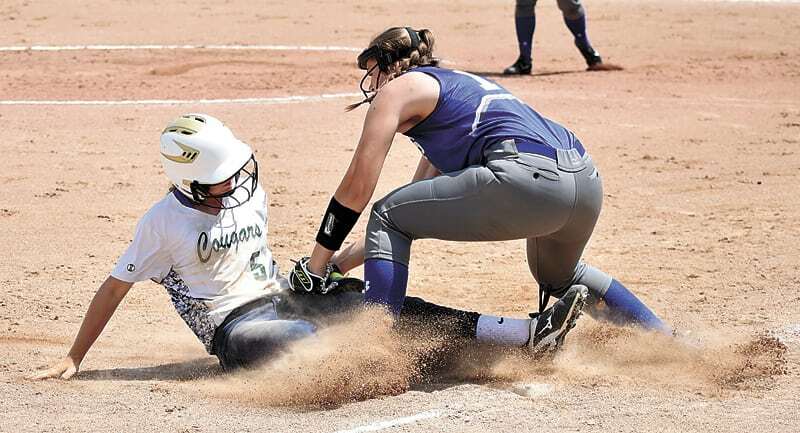 A good pitching performance was only bolstered by an equally-solid defensive showing, as the Comets had just two errors in each of the two wins. BCLUW (8-5) will take this weekend’s momentum and its current four-game winning streak into a tough week now, as it will head to State Center to face off with NICL West Division foe West Marshall on Monday then travel down to Le Grand for a date with 2A No. 11 East Marshall on Thursday. The Gladbrook-Reinbeck girls didn’t see the same success as BCLUW on Saturday. The Rebels fell to Central DeWitt 19-3 in three innings in their first game of the day, then turned around and lost to Sumner-Fredericksburg 19-0 in three innings, all in the span of two hours. G-R head coach Collin Arndt said his girls obviously had a tough time in both games, but he was able to get some fresh faces onto the diamond for the first time this season. “The experience was great, we got some younger players in there that had never played yet this year like Hannah Quackenbush, Alyssa Morgan got some good playing time today, girls that just haven’t played yet this year,” Arndt said. Some of that was forced by girls not being able to play, as Reagan Skovgard attempted to go in the first game against the Sabers but had an injury suffered the week prior against South Hardin flair up. 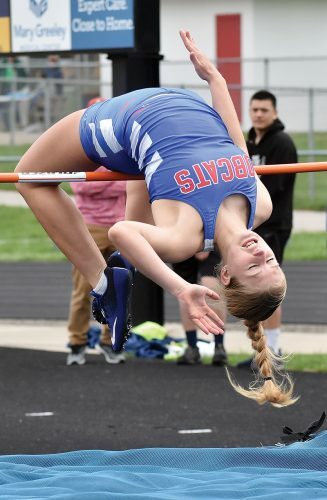 Rachel Cooley was absent for the first game due to ACT testing and Haleigh Berendes also couldn’t make the games, but Arndt said his girls are learning a valuable lesson about pushing through hard times. The road doesn’t get much easier for Gladbrook-Reinbeck (1-7) either, as it has a date with 2A No. 11 East Marshall on Monday in Le Grand then welcomes in Aplington-Parkersburg on Tuesday before heading back on the road on Wednesday to face off with West Marshall in State Center. Lauren Anderson, Bailey Ashton (6) and Lili Wilson; Christina Campbell and Alli Schaffer. WP–Anderson. LP–Campbell. 2B–BCLUW: Wilson, Parker Scurr. HR–BCLUW: Easton Swanson (2). LOB–BCLUW 5, WW 7. Kaylyn Hoth and Landree Kobliska; Shelby May and Hannah Rewoldt. W–Hoth. L–May. 2B–S-F: Abby Meyer. 3B–S-F: Jordan Burrows; SH: Faith Owens. LOB–S-F 8, SH 3. Hannah VanderHeiden, Kathryn Grau (2) and Talbot Kinney, Drew Anderson (2); Gracey Nagle, Tessa Sienknecht (2) and Taylor Gienger. WP–VanderHeiden. LP–Nagle. 2B–G-R: Megan Swanson. LOB: CD 8, G-R 4. Carlie Frost, Bre’Ann Olsson (3) and Alli Schaffer; McKaylee Dawson, Abby Brennecke (3), Kailee Pollard (5) and Erica Johnson. W–Olsson. L–Brennecke. 2B–WW: Sophie Dehl, Abby Payne; MHS: Regan Mazour. 3B–WW: Dehl. LOB–WW 6, MHS 7. Tess Sienknecht, Alyssa Morgan (1), Rachel Cooley (2) and Taylor Gienger; Chantelle Nuss and Landree Kobliska. WP–Nuss. LP–Sienknecht. 2B–S-F: Krayton Allen 2, Jordan Burrows, Kobliska. HR–S-F: Allen (8). LOB–G-R 2, S-F 3. Shelby May, Rylee Nelson (6) and Hannah Rewoldt, Emma Salvo (6); Cyrah Rasmussen and Lex Hesse. W–Rasmussen. L–May. 2B–CF: Cara Forsblom, Rasmussen. LOB–SH 4, CF 8. Bailey Ashton, Kiersten Kruse (5) and Lili Wilson; Cyrah Rasmussen, Abby Runyan (9) and Delphin Hellenthal. WP–Ashton. LP–Rasmussen. 2B–BCLUW: Cate Nason, Kaylee Goecke, Wilson; CF: Tjaden Petersen. HR–CF: Keeley Rath. LOB–BCLUW 3, CF 3. Mya Cavanaugh, Hannah VanderHeiden (5) and Drew Anderson, Talbot Kinney (5); McKaylee Dawson, Kailee Pollard (7) and Erica Johnson, Kyra Feldman (7). W–Cavanaugh. L–Dawson. 2B–CD: McKenzie Rosenboom 2, Alyssa Eden, Ava Morris; MHS: McKenna Major. LOB–CD 6, MHS 9. AP PHOTO Ñ Tom Lehman hits off the first tee during the second round of the Principal Charity Classic golf tournament Saturday in Des Moines. T-R PHOTO BY ROSS THEDE Ñ MarshalltownÕs Regan Mazour, right, beats Central DeWitt second baseman Alyssa Eden to the bag as shortstop Talbot Kinney (10) makes the flip during the final game of SaturdayÕs Dave Lee Classic in Conrad. Mazour was safe on the play. T-R PHOTO BY ROSS THEDE Ñ MarshalltownÕs McKaylee Dawson, right, is tagged out trying for a double by Central DeWitt second baseman Alyssa Eden (4) during the second inning of SaturdayÕs final game at the Dave Lee Classic in Conrad.